The other day, I saw a bug in my office. Normally, I exterminate such pests without a second thought, but this time was different. This time, I was already deep in thought working on this week’s sermon, and the bug was on the other side of my desk. Rather than getting up, walking around the desk, and doing the necessary deed, I decided to take the more passive approach: I just watched the bug for a few minutes. This bug had it in its little brain that the most important thing in the world was climbing straight up the window. 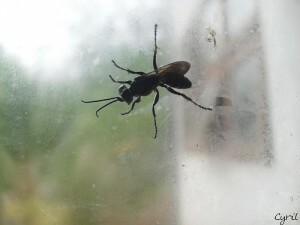 Hanging onto the window for dear life, it crawled higher and higher until it lost its balance. Then it fell harmlessly to the windowsill and began its trek upward again. Over and over again, this cycle repeated itself: the bug climbed up, fell down, and climbed up again. Of course, there is a humanistic lesson to be learned: no matter how many times we fail, we must pick ourselves up and move on, resume the course, carry forward one more time. The world is good at teaching us this message through all sorts of motivational speakers. But there’s something deeper here. While my office bug was able to pick itself up and climb upward on its own power, we have no power to pick ourselves up spiritually. While the bug naturally showed persistence in achieving its goal, we struggle to move forward in our walks with Christ. It is natural for us to be sedentary, hopeless, passive. The goal for us as disciples of Christ is in the same direction as the bug’s goal: to move upward, to climb higher: to grow and become more like Jesus, to bring about the kingdom of God on earth. And yet so often we find ourselves falling back into old habits and unredeemed ways of living. We look around, startled to find ourselves where we began, having the same spiritual ground yet to cover. This is the point at which God’s grace steps into our lives. Grace is what God gives to us that we absolutely do not deserve. Knowing God, having faith, receiving forgiveness for our sins – these and many others are gifts from God brought by his grace in our lives. Another gift from God is how he picks us up when we fall and puts us back on the path of growth. We simply can’t do that by ourselves. Yet such is our journey: ever upward, ever toward Christ, no matter what lows we experience. Carry on, fellow believers, and keep the goal always in mind!